Any cost-conscious organization sending employees abroad needs to be prudent and justify all the expenses of an expatriate assignment. Smart organizations know that a small percentage of the overall expat management cost protects their investment in global talent. International employee relocations can fail for various reasons: A company may have chosen the wrong team member for the overseas job. The expat may not get enough support on location and/or from the home office. The compensation and benefits structure may be insufficient. If the expat is part of a dual-career family and aligning those interests may be a challenge. And then there are the reasons we found to be of paramount relevance: The expat and their family enter the foreign location without preparing for the different culture, without knowing the language, and without competent assistance at the new destination. While data is inconsistent on how many global assignments are actually considered unsuccessful, it is safe to say that no matter how high or how low the number is – any expat posting that is aborted prematurely or doesn’t meet corporate goals is a wasted investment in global talent. With somewhere between 10-40% of all international assignments failing, the talent-related risk of global projects is enormous – for any organization. Depending on the type of assignment the typical average cost of an expat posting adds up to $300,000 to $650,000 per year. So it is absolutely imperative for companies to make sure they fully prepare and support expatriate employees before, during, and after their overseas assignments. 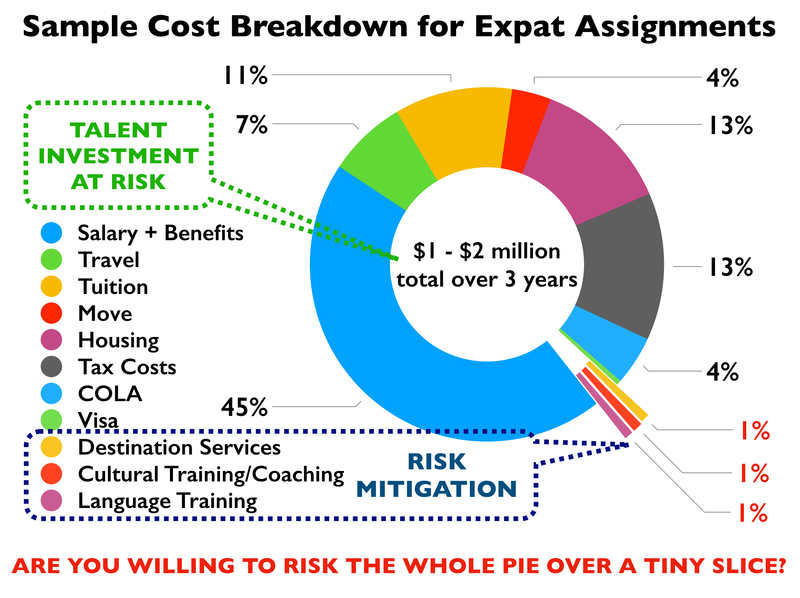 By these calculations, the amount required to protect your investment in your global talent is minimal compared to the overall expense of sending your employees abroad: Making cultural training and coaching available, offering destination services, and providing language training amounts to roughly 3% of the total costs of expatriate assignments. Yet, studies have shown that less than 40% of companies who conduct business internationally offer cross-cultural training to their assignees and family, and one third of global businesses do not even offer any cross-cultural training at all. Are you really comfortable with risking the entire pie over a tiny slice? How is your organization minimizing the risk of expat assignment failure? Our clients trust us and rely on us that we will lead their teams to more success across cultural borders. Let’s talk! SAVE YOUR PIE — SCHEDULE A FREE CONSULTATION NOW!